How Can St. Louis Improve Biking, Walking Access? With the clear, warm weather of summer, more St. Louisans of all ages are taking to the streets and the sidewalks on foot and by bike. The city has plans in the works to make walking, biking and running easier, from Complete Streets to separated bike lanes. “I think overall we have great facilities in St. Louis and there has been a lot of improvement in the five years that I’ve lived here,” said Aaron Hipp, assistant professor of social work at Washington University in St. Louis. His research evaluates how built communities affect the activity and health of those who use them. A look at walking, running, and biking in the St. Louis area. Hipp said the city is lacking in consistency and connectivity. While some parts of the city are friendly to walkers and bikers, “there is not infrastructure to run in every park, there is not infrastructure to bike throughout the city. The city is very divided north and south, particularly in bicycling infrastructure,” Hipp said. Trailnet’s Neighborhood Greenways project looks to transform residential streets to better accommodate foot and bike traffic. In addition to making the areas better for transportation, Allen said they are better for the environment than current infrastructure, and help manage storm water. 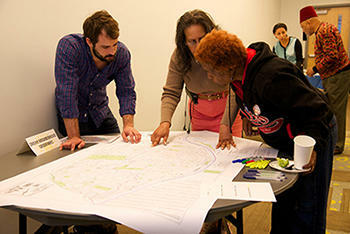 Residents map their dream Neighborhood Greenway routes at a North City meeting on May 14, 2014. “Cities around the country are putting them in to attract businesses and people,” said Allen. Along with the Neighborhood Greenways, St. Louis and St. Louis County have implemented a Complete Streets policy that requires the developer to consider all modes of transportation (automobile, foot and bike) and all ages and abilities when planning street construction. Great Rivers Greenway complements Trailnet in its endeavors. One of the methods that may come to the region soon is a bike share program. Great Rivers Greenway, Trailnet and their partners are in the middle of a feasibility study for a St. Louis program. 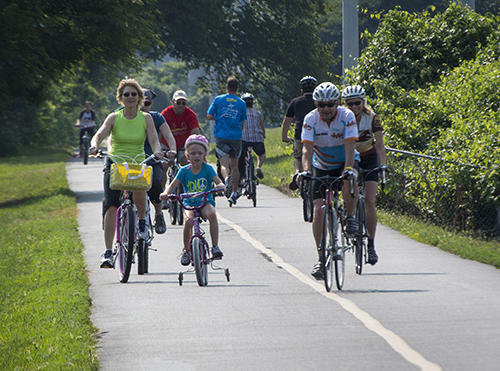 Great Rivers Greenway also wants to expand the number of on-road and off-road bike paths. “You can go farther on biking — biking to work, biking for errands, there’s a wider range of places you can go … so it opens the area up more. But biking infrastructure can be more costly. You obviously have to own a bicycle, there’s helmets, and because you are going greater speeds there is obviously a greater chance of injury — at least collision injuries,” Hipp said. Dr. Scott Kaar is the head physician for the Saint Louis University Billikens and an orthopedic surgeon specializing in sports medicine with Mercy. He says the most common injuries he sees are from over-use. There are a number of ways to avoid these common injuries. Marxkors says St. Louis is a great city to be a runner. While the city may be doing well to accommodate foot and bike traffic, Antoine and Allen see room for improvement. “You’re going to see more and more facilities and more opportunities for folks to get out for recreation and get out in the community,” Antoine said. St. Louis on the Air discusses issues and concerns facing the St. Louis area. The show is produced by Mary Edwards and Alex Heuer with assistance from Amanda Honigfort and hosted by veteran journalist Don Marsh. Follow us on Twitter: @STLonAir. Can A Bike Sharing Program Succeed in St. Louis? 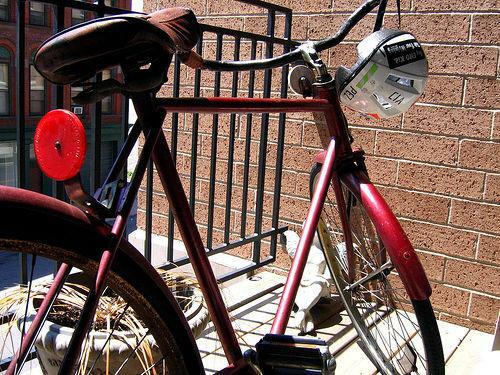 St. Louis could be the next U.S. city to host an urban bike-sharing program. Great Rivers Greenway is conducting a feasibility study to determine how successful such a program would be in the area. “We want to look at the destinations where our residents are traveling to on a daily basis, whether that’s [to] work or shopping areas, or dining areas,” said Assistant Project Manager Elizabeth Simons. The Show-Me State is designating the jumping jack as its official exercise in honor of the U.S. Army's second highest-ranked general. 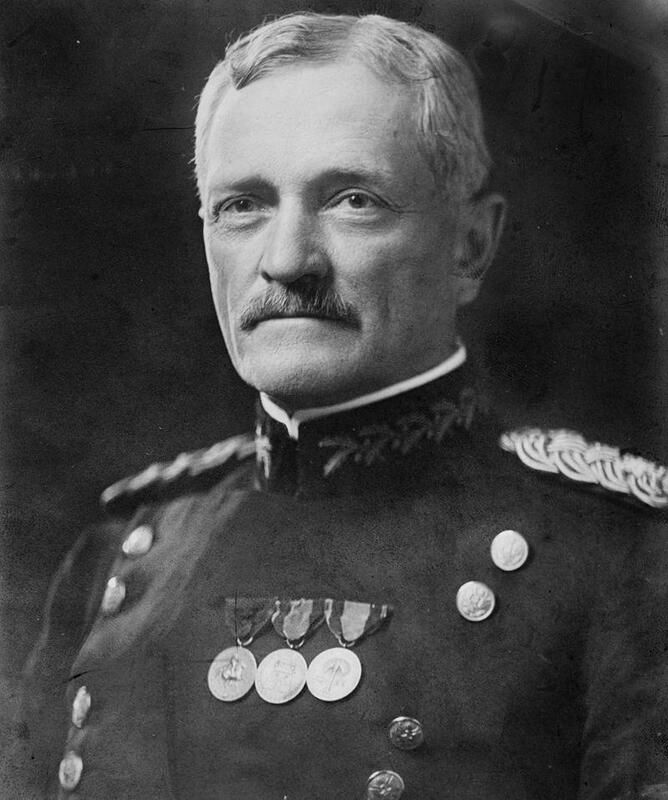 Gen. John Pershing, who was from Laclede, Missouri, is credited with inventing the exercise while training cadets at West Point before WWI. Gov. Jay Nixon signed Senate Bill 669 bill Thursday, which was sponsored by State Rep. Pat Conway of St. Joseph. "You've got a bad case of deconditioning," the doctor says. Actually, it would be the rare doctor who would say that to anyone. And though it might sound like something to do with hair, in fact, deconditioning is a familiar and more profound problem: the decidedly unnatural state of being physically inactive. As St. Louisans participated in National Bike to Work Day recently, a local group reflected on its efforts to make the region more bike-friendly. Great Rivers Greenway has released a report, grading St. Louis’ progress on a region-wide bike plan. The Gateway Bike Plan would build bike routes connecting parks, universities and major public areas throughout St. Louis City, St. Louis County and St. Charles County. Other initiatives under the plan would implement policies and training programs to support bikers.